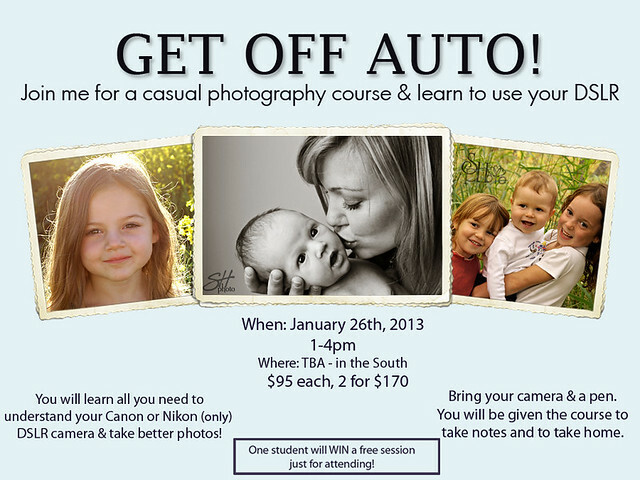 I am teaching my fourth ‘Get Off Auto’ DSLR Course on January 26th, 2013. If you recently got a new SLR camera, this is exactly what you need. All the basics of photography – you will learn Aperture, Shutter Speed & ISO, and how to take better pics of your kids. You will leave with all the literature, and I will even teach you my biggest ‘Ah ha moment’ with photography…the one, simple trick that helps put it all together. The course is designed to be quick, I only teach you what you need to know to take your camera off the auto setting and get amazing results. Good Evening, I received you email from my friend Annemarie. My 13 year daughter received a Nikon D33200, would this class be something for her? I think you mean the D3200, and if so yes! Where is the course this saturday going to be held?